My next location is easy to find. 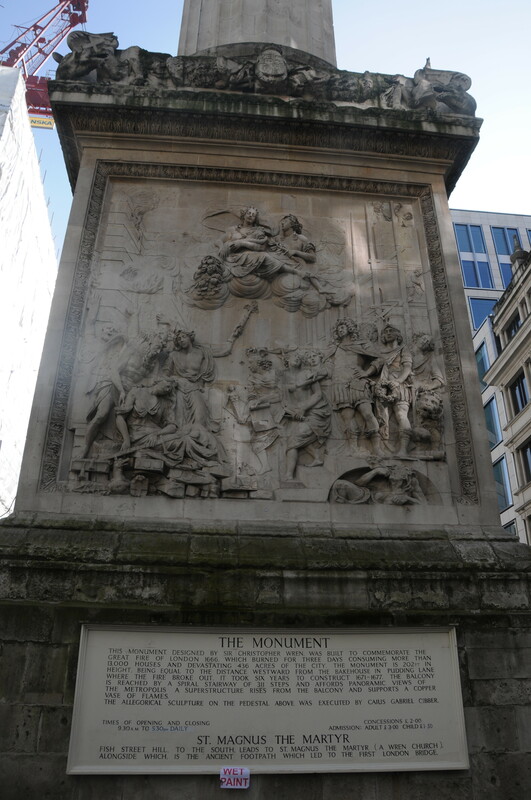 One of the most well known landmarks in the City of London – the Monument to the Great Fire of London in 1666. The Great Fire has been a theme to some of my earlier posts as it was this event which resulted in the building of the Wren churches that feature as landmarks in many of my father’s photos of a bombed city. 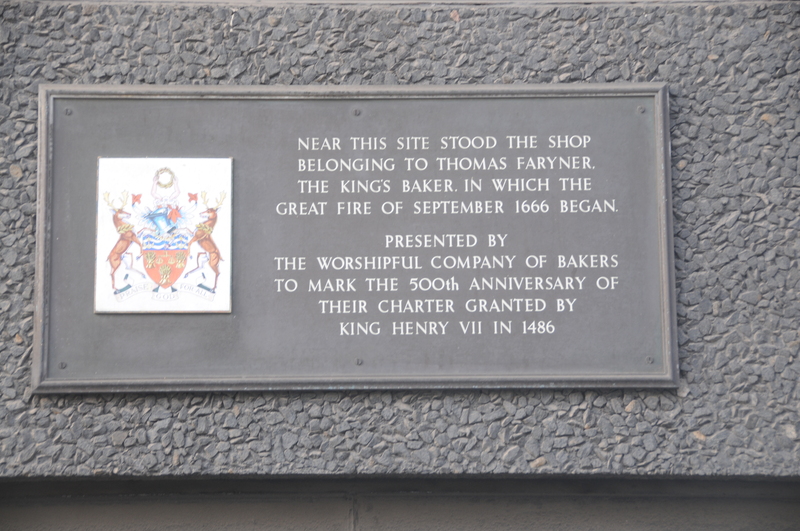 The impact it had on the City was such that a monument was needed to commemorate the Great Fire and celebrate the rebuilding of the City. Out of Monument Underground Station, I walk past the Monument and down to Lower Thames Street to find the location where my father took the following photo. 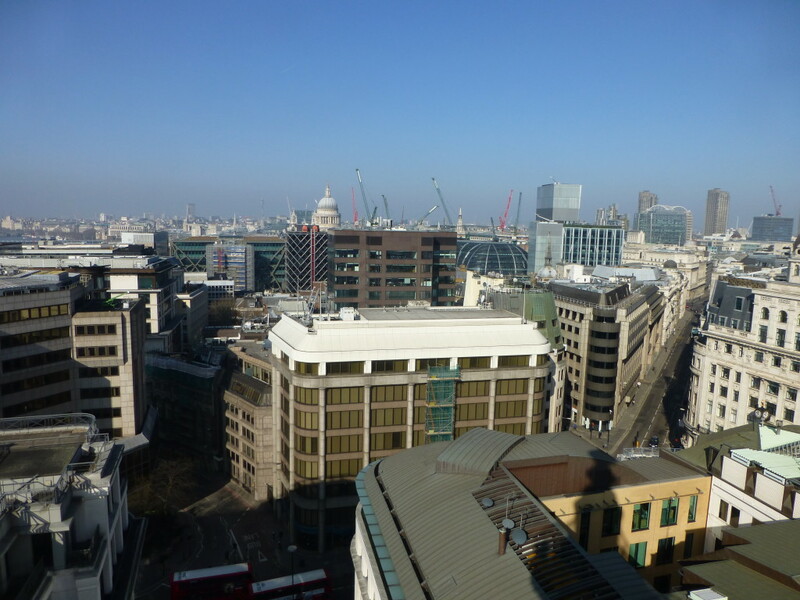 Lower Thames Street is much busier than when the above photo was taken and also much wider. In the above photo, the building on the extreme right with the street name was a Bank. This building was lost as part of the widening of Lower Thames Street into two, dual lane carriageways. Thames Street (Upper and Lower) marks the waterfront of the ancient City of London and follows the line of the wall that defended the city on the riverside. The sign on the left advertising “Best Large Mussels” is part of Billingsgate Market, located on the south side of Lower Thames Street. The building on the right with the curved top to the windows still exists. 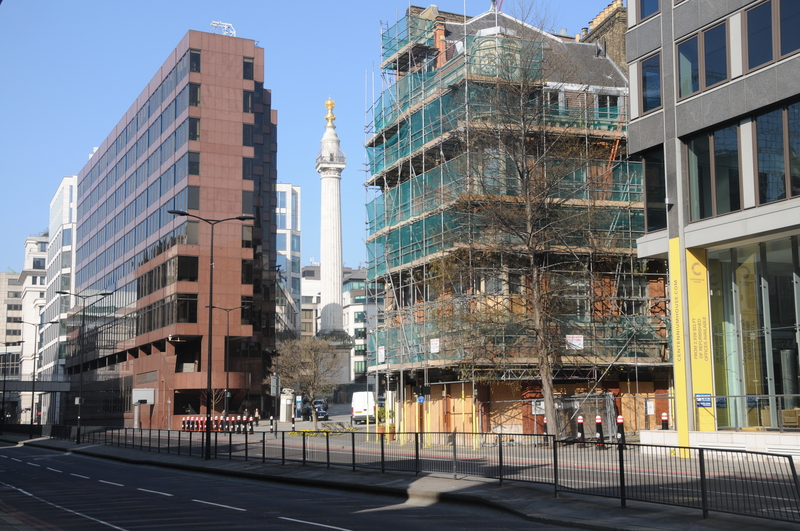 It is the building covered by scaffolding in my 2014 photo shown below (as with Fore Street, why are the key buildings always under scaffolding?) In my father’s original photo it was the Billingsgate Christian Mission. The name can be seen just above the 1st floor windows in the original photo. 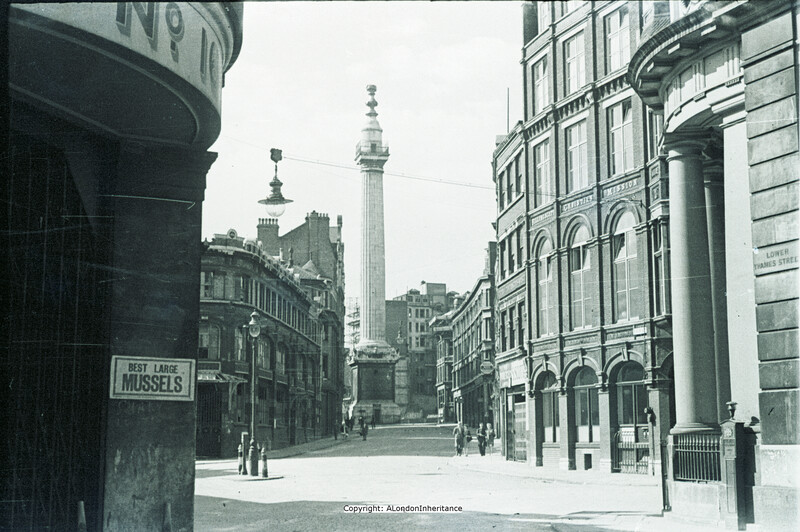 The Monument was built between 1671 and 1677 to commemorate the Great Fire of London. 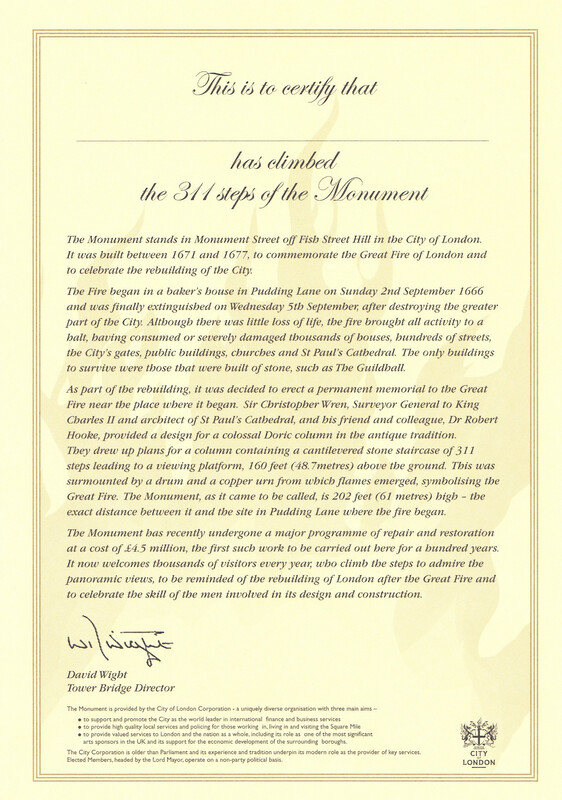 It is 202 feet high, which is the distance between the Monument and the point where the fire started in Pudding Lane. 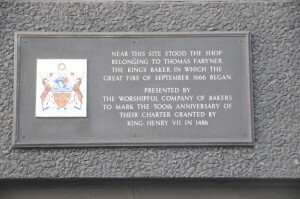 The site in which the Monument stands was formerly the churchyard of St. Margaret’s Church which was destroyed in the fire. 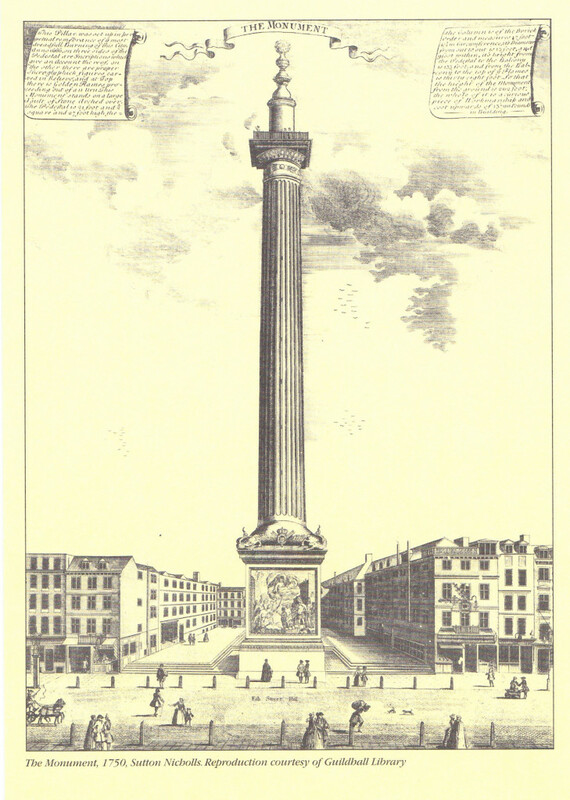 The Monument was often used by people throwing themselves from the top to commit suicide. Incredibly it was not until after the last suicide in 1842 that a cage was built around the top. Walking around the base of the Monument, I found the metal plaque shown in the photo to the left. This is in a very sorry state and from the rubbish around the base is not treated well. I believe that this is a parish boundary marker. It was made by E&S Poynder of London in 1838. The inscription in the middle is St. M.N.F. which is the Parish of St. Margaret New Fish Street. Fish Street Hill is the road that runs at the back of the Monument. This was the original thoroughfare down to Old London Bridge which was immediately south of Fish Street. The Black Prince had a palace here roughly opposite where the Monument now stands. 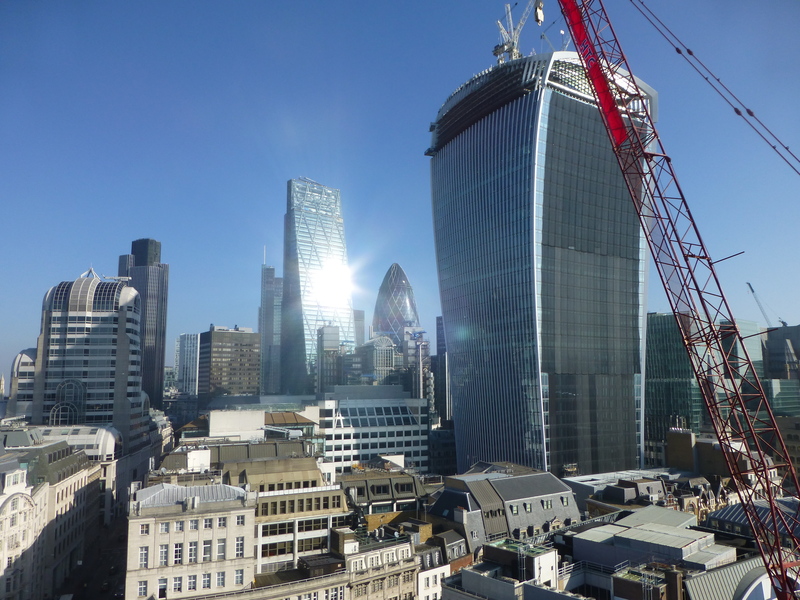 With the confidence that there continues to be a cage around the top viewing platform and with a six year old in tow who was sure she could make it, we decided to climb the 311 steps to the top. 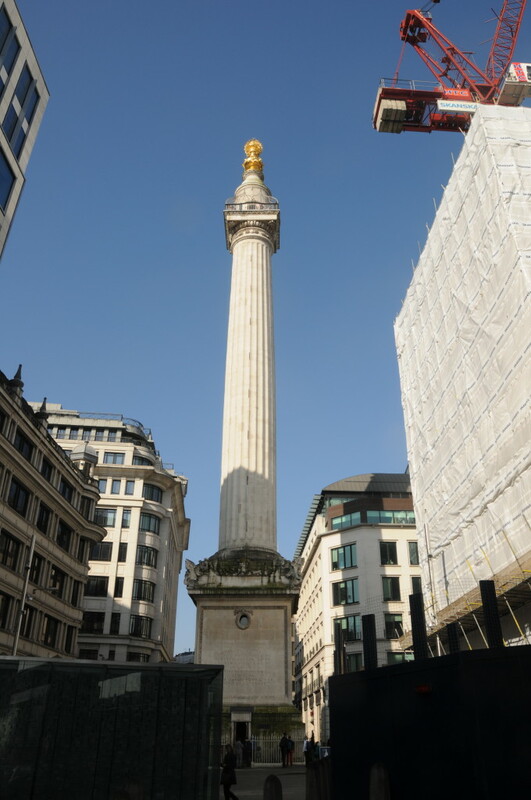 The Monument is managed by the City of London Corporation and climbing to the top (and getting down again) entitles you to a certificate from the Corporation. The view from the top is well worth the climb. I will leave you until next week with a selection of photos from the base and top of the Monument over a very sunny London. Towards St. Pauls which looks as if is about to be attacked by cranes. A change to the opening times requires a wet paint sign! 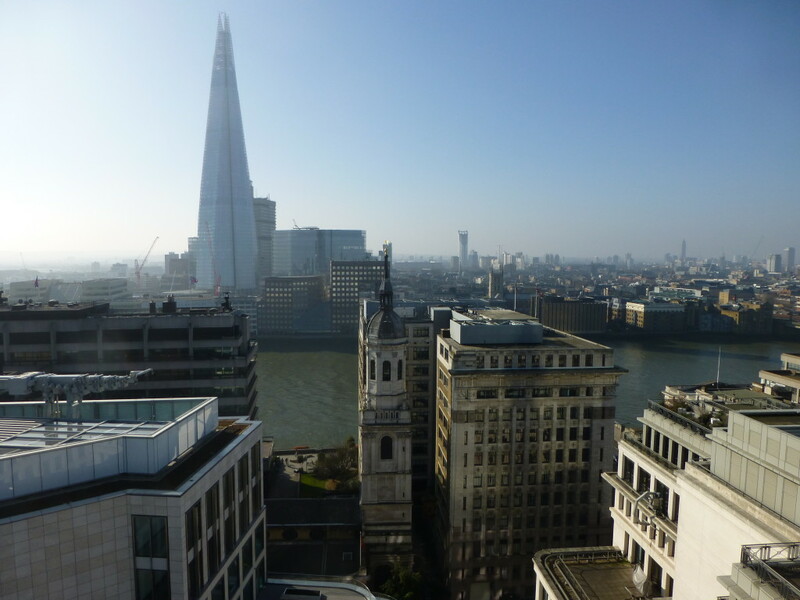 This entry was posted in London Monuments, London Vistas on March 16, 2014 by admin. Another stunning post! Thank you, David! What amazes me about your father’s photo is how quiet the street scene is – I wonder if your dad took the picture early in the morning? Of course, the City used to be very unpeopled in the evening and at weekends too, but these days there always seems to be something going on. 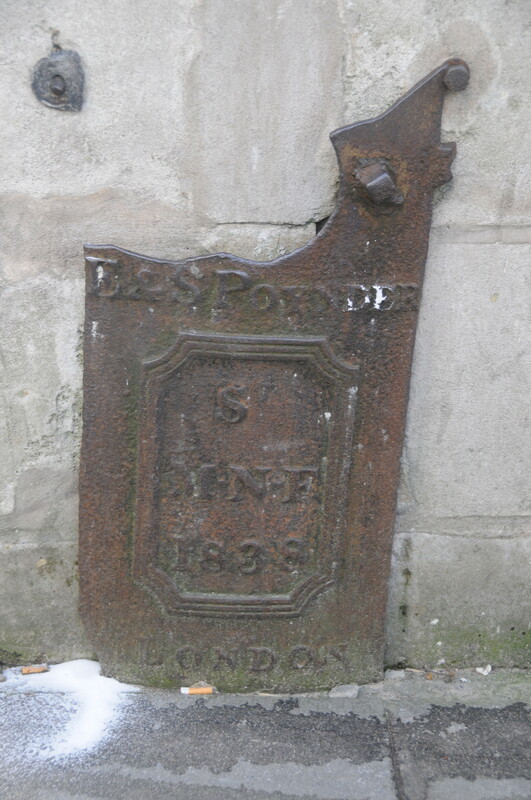 Really enjoying the vicarious trip around London David – you have a gift for noticing the little things, like the parish boundary marker, that makes it come alive, thank you! I would truly appreciate RSS being set for when posts are initially published, I only become aware through the RSS you have set on the comments section. Hi Rupert, thanks for the feedback. Will try and work out how to set RSS for posts. The damaged metal plate on the base of The Monument dated 1838 is a hydrant cover. I’ve photographed two others by E&S Poynder with different parish initials and dates in the 1830s and another by I Taylor (ST DIO BC 1842 ) where the hinged cover has broken away and you can see the nozzle of the water pipe. 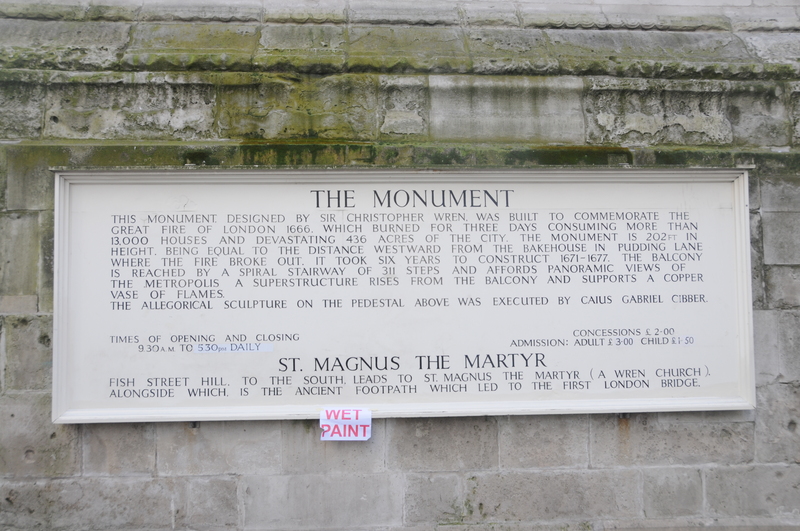 One of the Poynder ones is under the tower of St Magnus Martyr. Whether they also served as parish boundary markers I don’t know but I doubt. Jon, thanks for that, I did not realise that is what they were used for. I did find another yesterday at St. Mary Abchurch, by F. Smith. In this one the nozzle of the water pipe is very obvious.